Ah. 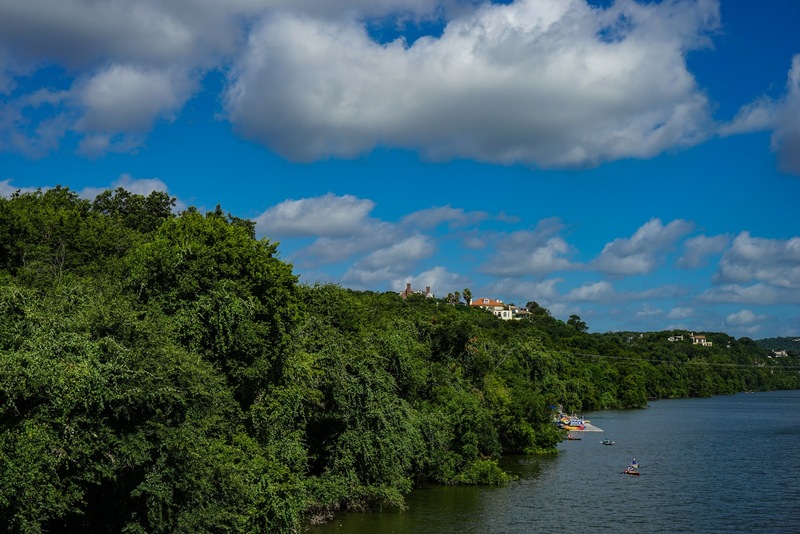 Those Austin Summer Skies. There are two overlapping lenses that I bought for the Sony A7 series cameras. Both are wide angle zooms and both were designed by Zeiss, but they come from very different eras. One is an older, manual focus zoom lens that was made for the manual focus Contax cameras which were popular in the 1980's and 1990's. It's a very solid and heavy lens that utilizes a push-pull design. It's the 28-85mm f3.3 - f4.0 lens. Used with an adapter on an A7x camera it is front heavy but it does a very nice job when it comes to making images. It is moderately contrasty and has a very rich color palette. By that I mean that the colors are very well differentiated and quite nicely saturated. It is not overly energized but has a nice visual balance to it. As a photographer who likes to make classical portraits I am happy that the long end goes out to 85mm as opposed to the more current vogue of emphasizing the wide end over the long end. The "cool" Canon, Nikon and Sony zooms of today start at 24mms and end at 70mms. Nice if you really need to go wide most of the time but not really optimal for beautifully drawn headshots. The other lens is a member of the new order. It's the 24-70mm f4.0 Zeiss/Sony. While it's not as long as I would like it's a very functional street shooting lens and in some ways is a complement to the above lens and not a redundancy. Whereas the manual lens pushes one to be more methodical and careful the newer lens combines with the latest A7X cameras to deliver fast and accurate autofocus. This makes for a system that just seems made for taking quick slices of life while moving through time and space. The AF lens is also much lighter than its manual, distant sibling which makes it much more fun to drag around during the day. The lenses seem to render colors and tones in very similar ways but the main difference in imaging between the two lenses is the overall contrast of the resulting photographs. The older lens, no doubt optimized for use with film, is only moderately contrasty and has a balanced look to it. The newer lens follows the modern design idiom in making the contrast stronger and placing more emphasis on sharpness than a certain visual balance. So, yesterday when I left swim practice and went for a walk I chose to use the new lens. I knew I would be photographing things that might benefit from the combination of contrast and high sharpness and I knew that I would benefit from the lighter weight and faster operation. If I had been heading to the studio to make portraits with specific lighting I'm pretty sure I would have made the opposite choice. Of course I am spoiled. A good photographer could press either lens into either kind of service and get satisfying results. Additionally, with a little work in post I can make the older lens look very much like the newer one. But it is nice to have two different tools that, while nuanced, do have differences that can be expressed in daily shooting. Just as I've come to realize that it can be useful to have more than one model of 50mm lens the same applies to standard zoom lenses. Part of the difference is the psychological momentum created by the heft, feel and operation of each lens. To achieve perfect focus with the MF lens one must slow down and take advantage of the camera system's focus magnification feature. This works best when adapting a contemplative style of photography. 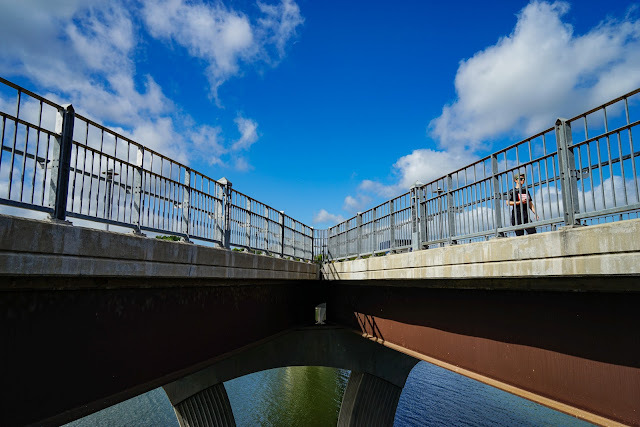 When shooting still life, landscapes, objects, and people who aren't moving around too much. Knowing the limitation of manually focusing slows one down and makes one become more methodical. When using the AF lens one is freed to turn, snap and continue on without having to break the flow by demanding a greater concentration on the mechanical steps of picture taking. Both methods are valuable and both have their limits. Part of being an artist is to desire the right tool for creation ---- in the moment. Different moments call for different approaches. It's nice to have choices. A look toward the neighborhood where my studio is located. Just Southwest of downtown and across the Colorado River. This view is about a mile from home. The lakes are full and the sun is shining. 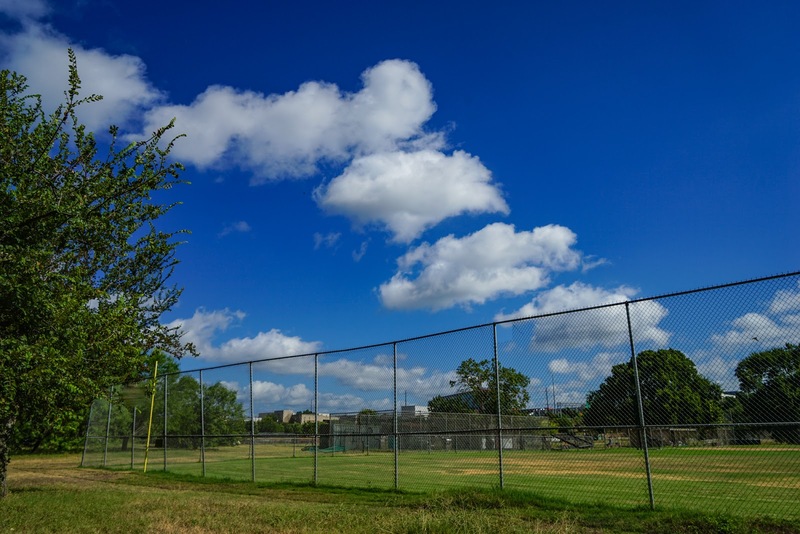 Even though the heat is oppressive it seems everyone in Austin is heading outdoors. 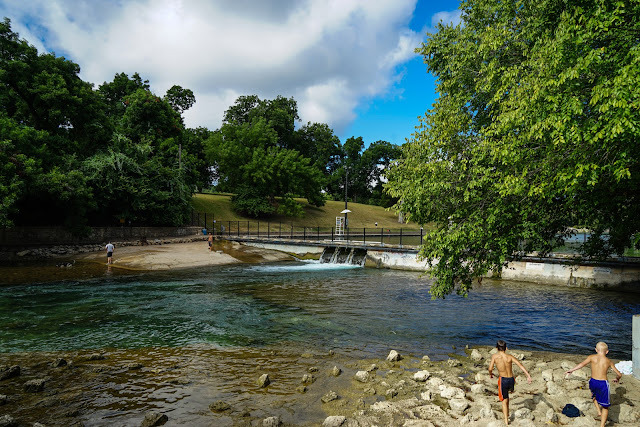 Some are walking the streets of downtown, looking for Pokemon, but the rest are heading to Barton Springs, the streams along the Greenbelt, or out to the lakes. Yesterday, in the middle of the work week, I drove over a bridge across Lady Bird Lake; the lake that runs through downtown. There were hundreds and hundreds of people cruising around the water below on paddle boards. As I walked along the hike and bike trail there was a continuous stream of runners heading towards me and heading away. I was out taking taking a walk with the same old camera. I've found a camera among the assorted collection that most fits my style and temperament. I may shoot jobs with something else but this one is as comfortable as an old pair of sandals, well broken in. And the funny thing (to me) is that it's the last one in. I bought it only a month or so ago and it was already well used. But comfortable. A great camera to take along in the hot weather, just in case I see a Charizard under the Lamar Blvd. Bridge.